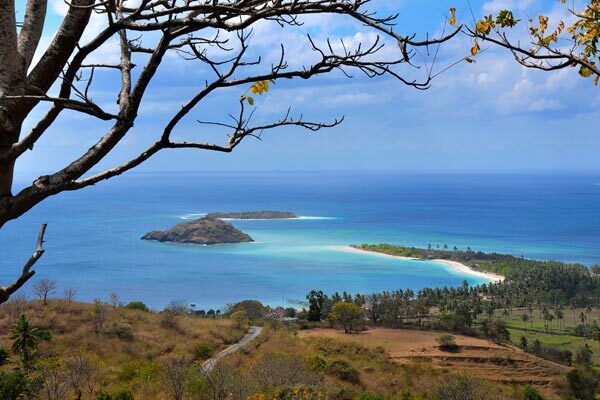 Lombok, the famous Indonesian island, is a tourist magnet. Because of the fact that it’s an island, there are more than a dozen of beaches there, all with their own, unique atmosphere. The South Asian region is very beautiful, and the climate there is nearly perfect. So, just imagine yourself sipping a cold drink while lying under a comfortable umbrella and you’ll instantly fall in love with this place. Today we’ll talk about the Elak-Elak Beach that’s located in Sekotong area, famous for the thrilling views. Yes, the esthetes will have a lot of fun there. As a matter of fact, this place is suited for a very wide range of foreigners, be it fans of swimming, snorkeling, or just lying around. Let me tell you right now that if crowded beaches with noisy kids and pushy local merchants is what you’re looking for in Lombok, this beach won’t really be great for you. While it is pretty popular among the more mature tourists with families that just want to relax and have a good time, it’s not nearly as “hot” as, say, the Senggigi Beach (one of the most famous spots on the island). Wild parties till the sun comes up, bars and restaurants on every single step of the way, and lots of trash lying around – that’s not really what the Elak-Elak Beach is all about. This place is for the visitors looking to admire the view and entertain themselves with a nice book and some delicious snacks. What Is The Elak-Elak Beach All About? The panoramic views, the “chill” vibes and the beautiful ocean will, most definitely, linger on long after you leave the island. A lot of the locals love to come to this place to join forces with the fans of water activities. This is one of those unique spots that don’t need to do anything out of the ordinary to please the foreigners. At the same time, there are some festivals and celebrations taking place in Sekotong Barat, and it would be wise to learn about them in advance so that you can enjoy the Elak-Elak Beach to the fullest. Ask the locals – they’ll tell you exactly when to arrive at a certain place to join the atmosphere of a holiday. The dates change all the time; so, make sure to keep track of it all. As for accommodations, you won’t have a problem finding a decent place to stay even if you’re on a budget. People with thick wallets will appreciate the luxurious apartments with breath-taking views. There are also hotels, guest houses, and, of course, bungalows in the area, perfect when you’re traveling with your friends and want a taste of that Lombok experience. As for restaurants/cafes, there’s plenty of that as well, and, again, you’ll be able to have a delicious meal for only a couple of dollars. That’s the beauty of this island: it is suited both for the rich folks and the regular tourists. I highly encourage you to rent a bike from one of the local renting offices and enjoy a thrilling ride through West Lombok. It is a very beautiful place, with lush forests, amazing beaches, and very kind, friendly people. Yes, it’s always great to watch TV in the hotel room and/or get a tan under the sun on a beach, but you’ll only get to see the island for what it is when you ride through the villages. Believe me – it will be even more satisfying to read a book at the beach once you’ve been to all the neighboring settlements. For tanning, don’t forget to grab a cream and a pair of sunglasses, as your American/European skin is probably not ready for that hot Indonesian sun. People get sunburns out here all the time, and it’s not fun at all. As mentioned earlier, the Elak-Elak Beach is a wonderful place. However, it could use a lot of “help” from the Lombok officials. I believe that it’s got a huge potential, but in order for it to shine through the government will need to make it more tourist-friendly. I’m not saying it looks abandoned or anything like that, but the roads could’ve been better, that’s for sure, even though they are better today than they used to be in the past. You actually have to always keep in mind that a faraway island might not be super comfortable, and sometimes, that’s a big part of its charm. From that point of view, this spot is alright. What Is There To Do At The Elak-Elak Beach? Well, it means tongue in Sasak, and if you take a look at it on the map at the bottom of this article, you’ll see that it actually looks a lot like a tongue. Still, I was kinda puzzled to learn that, because back in the day, nobody had any satellites to take pictures from high above. So, how did the Sasak people understand what it looked like from a bird’s-eye view? The white sand, the calm ocean, and the heavenly views turn the Elak-Elak Beach into a fine place for gathering your strength and having a change of scenery. The fact that the waves aren’t steep might be a disappointment for the fans of surfing. Thankfully, Desert Point is not that far away, and it’s considered to be one of the finest spots for surfing on the entire planet. So, enjoy the tranquility of the Elak-Elak Beach and then move to DP to check out the crazy men and women that conquer the waves with a smile on their faces. Even if you’ve never been much into this water activity, simply sitting on the beach and watching them will already be more than worth it. I mentioned Desert Point just now and have to also tell you about the wonderful Gili islands that are right in front of Pantai Elak-Elak. Renting a boat is cheap in Lombok; therefore, it would be a lovely idea to spend some time in the sea and to visit those islands. Gili Gede is a very special place and I had fun there – I’m sure you will too! As always, don’t forget about your phone/camera, because these days, a trip isn’t a trip unless you’ve got some amazing pictures to prove that. I’m always telling folks to forget about their gadgets and focus on what’s in front of their eyes, but you can’t go against the modern-day trends, can you? Sekotong is famous for the pearls – the locals are busy “catching” them 24/7. When the sun sets, the Elak-Elak Beach turns into a beauty. If you’re traveling with a significant other, climb onto one of the local hills and gaze into the horizon. The locals are doing a great job of keeping the beach civilized, and, since it’s not the most popular landmark, there isn’t any trash lying around, which, of course, gives it some cool points. Summing up, I want to say that while there’s nothing extraordinary about the Elak-Elak Beach, it still is a wonderful place to visit, especially if you’re traveling with your children and want them to play on the shore and swim in the ocean. For that, it is perfect. As we already know, it is located in the Sekotong area, which is pretty far from the center of the island. From the Lombok International Airport, the shortest route will take 1 hour and 25-30 minutes (Jl. Bypass Bandara Int. Lombok, Jl. Raya Lembar, Mataram; Jl. Raya Sekotong – Lembar towards Jl. Raya Sekotong). However, please keep in mind that the most popular routes are usually also the most crowded ones (meaning traffic there will probably be bad). The alternative route – Jl. Bypass Bandara Int. Lombok, Jl. Raya Lembar, Mataram; Jl. Raya Sekotong – Lembar towards Jl. Raya Sekotong – is 60 kilometers long and will consume 2 hours of your time. Mataram, the capital of Lombok, is another popular spot for tourists. So, if you’re trying to get to the Elak-Elak Beach from there, the route won’t take more than 1 hour and 20 minutes. It’s mostly straight and the road is nice and smooth. Since our destination is a beach, some tourists that land in Bali prefer to rent a speedboat and travel all the way to this spot. You can also rent a chopper, but it will cost you a lot more. The most popular route is from the Lombok airport, of course, and a taxi driver won’t charge you much unless it’s the high season. Watch out for those fraudsters that mask themselves as guides but do a lousy job of, well, guiding. You don’t even need one to enjoy this beach! Cozy is probably the best word to describe this beach. I felt like I knew the place, even though it was my first visit. That's exactly what Elak-Elak needs - some proper infrastructure to turn into a bigger tourist magnet. There are some cafes, restaurants, and food stalls in the area, but it would still be a good idea to pack some snacks. Despite the fact that slow and boring beaches aren't really my thing, I did enjoy it with my girlfriend. The Elak-Elak Beach has nothing in common with Senggigi, Lombok's most famous beach. It is clean, safe, and tranquil.